As a wearable device, it's easy for dust, hand lotion, soap, and other common elements to come into contact with the Apple Watch. If it collects around the Digital Crown, its performance can be reduced. 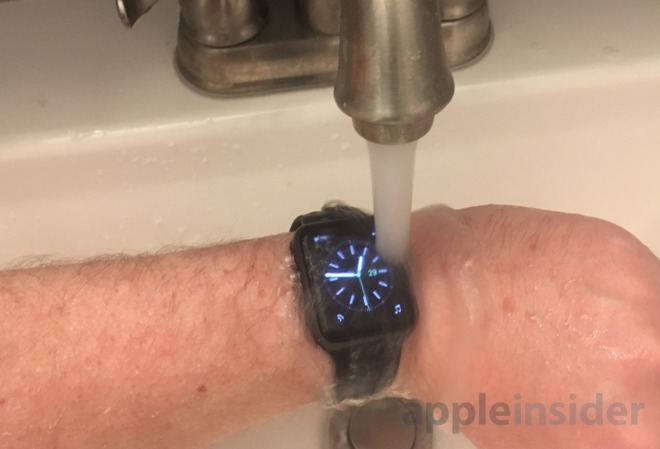 But because the Apple Watch is waterproof for Series 2, and water resistant for Series 1 and the first-generation models, all of Apple's wrist-worn devices can be quickly cleaned in the sink. Apple recommends powering off and holding the Digital Crown under lightly running, warm, fresh water from a faucet for just 10 to 15 seconds. Simply rotate and press the Digital Crown as the water runs to help push out any substances that have collected underneath. There's no need to use any cleaning products, like soap, when repairing the digital crown —just water should do the trick. After completed, it's recommended to wipe the device with a non-abrasive, lint-free cleaning cloth. If you have a water-resistant Apple Watch band, like the silicone sport option, or woven nylon, you can even leave the band on during cleaning— or leave the watch secured on your wrist. However, if you use your watch with a leather band, Apple recommends removing it from the device before cleaning, in order to prevent water damage. For more, see how the Digital Crown can allow you to discreetly check the time in a dark environment, like inside a movie theater, with Apple Watch Series 2. And see AppleInsider's ongoing helpful tips and guides to get the most out of your Apple products, apps and services.